A retired occultist turned police officer must battle a former lover as she attempts to summon forth demonic forces after escaping an asylum. In space, they love to hear you scream! Charlie: [Charlie finds the last Critter eggs] Alright you gum-balls. An okay entry to the series but extremely watered down. 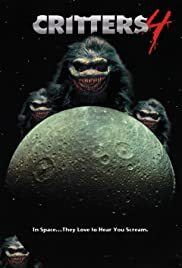 At this point the CRITTERS series has pretty much lost its flare, this entry seemed to have taken itself more seriously because there was virtually no humor where the other films each had a fair share, the Crites never once shoot their trademark darts so the writers seem to have forgotten to add that small little detail and there is very little excitement because there's barely anything that happens. On the plus side the acting was good all around and the script wasn't exactly terrible but the fact that this film leaves out certain key elements like I mentioned before is probably the film's biggest downfall, because for a film that has three others to live up to, this was rather disappointing. The only thing that kept the film from being a total waste was the good performances by the cast, its not a bad movie and its mainly and okay entry but fails to reach any of the previous films due to the fact that several notable elements were left out.